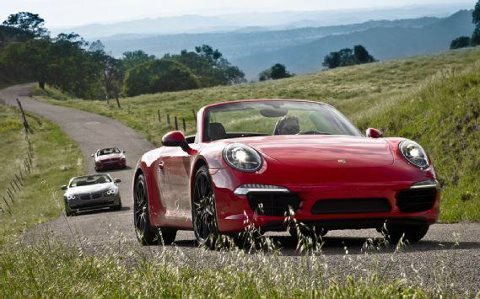 There was lots of excitement in June -- the new Boxster arrived and our region had a record turnout for the all-day driving tour. There are plenty of days ahead for long drives in the Porsche. Check out the latest news about events that are yet to unfold, new members, details about members and their Porsches and more. Enjoy the summer. July 6 -7 - Millers at the Mile. State Fair Park. Courtesy announcement. Details here. July 8 -15 - Porsche Parade, Salt Lake City. PCA's annual gathering of members from across North America. July 12 - Board meeting. 6:30 p.m. Members always invited to pull up a chair and participate. 62nd and Good Hope, Milwaukee. Wisconsin Club Country Club. July 14 - Driving tour with Elkhart Lake as the destination to spectate at the Road&Track Concours d'elegance on the streets of Elkhart. Dinner option. Details here. You must RSVP for the dinner by July 7. July 17 - Porsche Night at Highland House. Courtesy announcement. Details here. July 30 - DE classroom session II. Details here. Aug. 4 - Car Show at the VA Center, Milwaukee. Free. 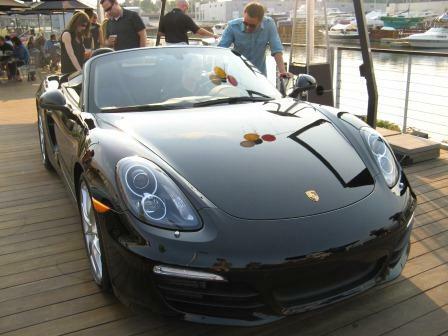 Bring your Porsche for the veterans to enjoy. Details here. Aug. 4 - Region Picnic. Enjoy an old fashioned picnic with fellow region members. RSVP by Aug. 1. Details here. Aug. 5 - Cars & Coffee, Lake Mills. 2 Shores International. Aug. 12 - Autocross at Miller Park. Details here. Aug. 17 - 18 - Porscheplatz during the ALMS race at Road America. More details coming soon. Aug. 25 - Club day at the Milwaukee Masterpiece. Details here. David Moore drives a 1979 Porsche 911 SC Targa. “My wife and I have named it Lilly,” he reported. Lilly is a deep maroon -- a custom color. “She is mostly stock, although it has been lowered to European ride height, and has C2 Cup wheels. I am the fourth owner, and although the car has a venerable 241k miles on it, the engine was rebuilt at 200k,” he said. David said he grew up with Volkswagens, and “so I had a special appreciation for German cars. In high school I wrote a research paper on the evolution of the 911 models. 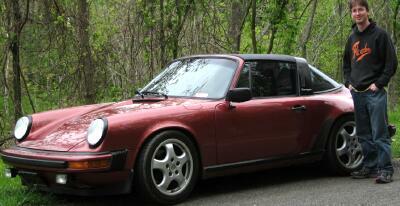 I got to ride in a 911 SC a few months before I got my driver's license, when I was 17. Whenever I went to an auto show, most of my focus on was on the Porsches. “Last autumn I was in my second-to-last semester of graduate school, finishing my Master’s degree in Computer Science. My wife and I had been planning to get a second car after I graduated. She surprised me by suggesting we look at getting an older Porsche 911 instead of something new. She knew I had always wanted one, and an older 911 is easier to maintain yourself than most new cars,” he said. The Moore’s eventually located Lilly in North Carolina. “After chatting with her owner, I discovered he was active on the same online forum I had been frequenting. I did some searching of the forum and discovered he had bought it in 2003 from another active member of the forum. These two, the 2nd and 3rd owners, were avid owners who had maintained the car and treated it well. Despite the high mileage I determined the car met my criteria,” David said. 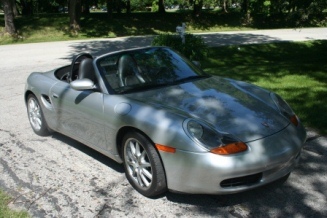 “I was able to get it at an excellent price, and the seller even had the Targa top rebuilt before I picked the car up. Three days after I successfully defended my Master's thesis, my wife and I flew out to North Carolina and spent a wonderful weekend driving our new car home. In the month and a half since I acquired it I've been enjoying driving every day I can, meanwhile fixing minor issues along the way,” he said. on the way home from North Carolina. 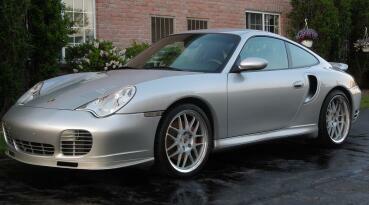 Ryan Braithwaite drives a 2004 911 Turbo Coupe, Arctic Silver/Black, 6 speed. He’s the third owner and the car had 27,800 miles at time of purchase in May. By early June the mileage is just under 32,700, “including a 1,500 mile drive back to Wisconsin with my fiancé, and I will be easily over 5,000 for the first month,” Ryan reported enthusiastically. The car is stock with the exception of aftermarket 19-inch wheels. Options include heated power sport seats with painted sport backs, carbon center console/shifter/e-brake, and painted silver bottom side sills, front lip spoiler and front intakes, versus the standard black. “I found the car at a dealer in West Palm Beach, Fla. I first saw the 996 Turbo at the Chicago Auto Show in 2001, and have been watching the 996 Turbo market since about 2008 in anticipation of a future purchase. I started searching in earnest in March of this year and quickly became convinced that a car with a CPO warranty was a must, despite the significant initial savings offered by an earlier, out of warranty car,” Ryan said. Ryan Braithwaite's 911 Turbo Coupe. Ryan is a shareholder attorney at a Milwaukee law firm. Glenn Schrubbe is a Milwaukee-area native who grew up in Wauwatosa and currently lives in Elm Grove. He is Certified Public Accountant and owns his own practice, with offices in Elm Grove and Milwaukee. “I’m married with 3 grown children. Also, I’m an avid woodworker, interested in the arts, enjoy good food, and, of course, I love cars,” Glenn said. He I started looking for a Boxster about four years ago, after building a 356 Speedster replica. The donor car is a 67 VW, with a 1865cc VW engine. “I struggled to make the 356 replica appear as original as possible incorporating as many original parts as I could locate. To appear more authentic, among other small things, I relocated the e-brake from between the seats to under the dash. My efforts paid off, most of those who see it believe it to be original; I’ve fooled the best. For the past four years it’s been my summer daily driver. It’s truly a fun car,” he said. Glenn said his interest in German cars particularly Porsche, dates back to hischildhood. “In 1962 my dad bought a white 1956 Speedster, shortly after purchasing it he had it repainted silver. Sadly, in late ‘64 the car was in an accident and remained drivable but was garaged until he sold it in 1978. That’s where I lose track of the car -- I believe the car was sent to Canada for restoration but I’m not sure. Unfortunately, I have no other details on the whereabouts of his car after the sale, nor do I have the VIN number,” he said. His dad was a PCA member. “As a six year old I was not really captivated by my dad’s decision to drive a sports car, let alone a Porsche. However, after few family trips to Road America with my dad, and later with my own kids, I became a believer. I thought building the Speedster would satisfy me, but sadly it didn’t. The Speedster turned out to be a real show car, I can’t drive Speedster anywhere without being stopped for questions or comments. The speedster is a great car, but I just wanted more…. 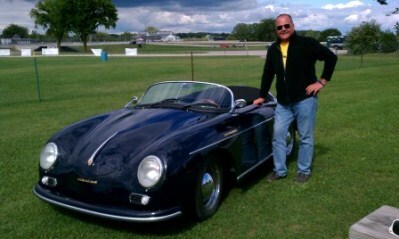 Glenn Schrubbe and his 356 replica. Glenn's 2001 Boxster. 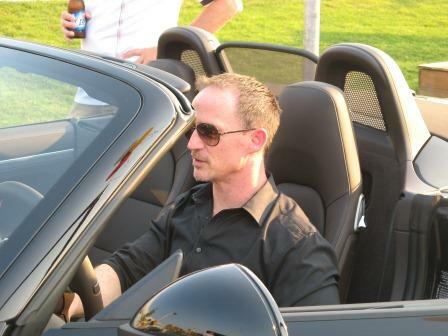 In May 2012, he purchased a 2001 silver Boxster (986) with 49,000 miles. “It was offered for sale by International Autos in Milwaukee, a single-owner vehicle, previously owned by a Milwaukee attorney who five years ago moved downtown and ultimately decided to by an urban car, a Mini cooper. The 986 is amazingly clean and appears to have been well cared for. I am in the process of having the intermediate shaft bearings replaced as well as a few other minor issues handled. Glenn ends his story with this advice: Life’s short, enjoy your ride. “I was looking on Craigslist when I saw the ad. It was priced at $2,500 OBO and was across the border in Lake in the Hills, Ill. I called and got a 17-year-old owner on the phone who told me his bottom dollar cash price was $2,000. In spite of his assertion, I offered him $1,800 and told him that I would pick it up as soon as I could get to his location. “When I got there, the car was in a mirror-walled garage with lots of other toys around it (2 high-end Mercedes, 2 nice motorcycles, a 1/5 scale model helicopter, etc...). The windows were down and the moon roof was up. From my observations, I derived that there were no fluid leaks as the dad wouldn't have allowed the car to be parked in his beautiful garage if there were, The windows worked and the top worked. I then saw the driver’s side-view mirror was off and there was a dent on top of the front drivers’ wheel flare. “I tossed the kid the money and asked for the title. There was no gas in the car so the dad took $50 out of what I had given him and gave it back for a fill-up. Maaco (yes, Maaco) fixed the body issues in two days with a seamless repair/paint. The car ran great, and the interior was complete and functional. It had a 6 month old clutch and timing belt, and since it's pre 1996, no emission requirements,” he said. Since the purchase, Christopher has replaced the instrument cluster, driver's mirror, crankshaft pos. sensors, ECM, fuel pump and filter, main coil, several relays, stereo and front driver's seat ($75 new on Craigslist). “It has had a full tune up and sits on a decent, although soon to be replaced, set of Yokohama tires. I love the car and use it every day weather permits me to. I intend to have the phone dials painted black when new rubber is mounted because the aluminum just doesn't look right with the metallic gold color of the car,” he said. 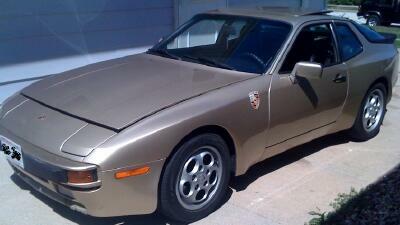 This is his second 944 and third Porsche. His first Porsche was a 1970 911e in Guards Red. “I was 20 and it didn't last long. I then got a 1988 944na in L90E Alpine White/Black int. Too much wrong with that car to keep it due to budget. My goal is to have a 911sc in Turquoise/Tan,” he concluded. Christopher is a Sergeant with the Wisconsin Dept of Corrections (see below). 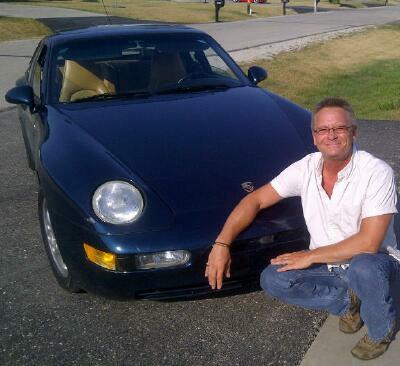 Tyson Schwiesow, an ophthalmologist in the Green Bay area, bought his 2006 9114S about four years ago. “I was looking for a solid car to use year round and have not been disappointed. It hauls my mountain bike in the summer and skis in the winter. I don't beat on the car, but I don't pamper it either. "I bought this car to learn how to drive well. I've done a Skip Barber race weekend, a bit of autocross, and I'm looking forward to doing a few track days and moving on to PCA or SCCA racing,” he said. He is also “looking forward to my first pull on the sequential shift in a Cup car,” Tyson said. 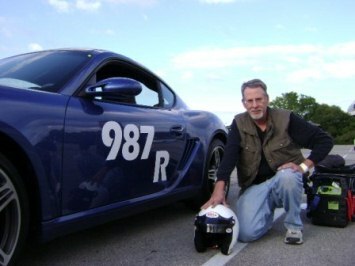 Kinney Adams drives a 2008 Cayman S, Metallic Cobalt Blue that he purchased last September. The car has one previous owner and 28k miles on the odo. Kinney Adams and Cheetah Blue. So last summer he started thinking about getting back into autocrossing. After scouting out an SCCA autocross event at Miller Park over the Labor Day weekend, he thinks he came down with what he labeled “Passionate Driving Fever.” He said he left Miller Park and drove straight to David Hobbs Honda to see if he had any SU2000s in the used car lot. “Nope. And then, the subconscious dream awoke. Hmmm, ya know, Concours is just up the street. As I pulled into the Concours lot, there was this beautiful blue gem of industrial design and passion for driving performance. Call it love at first sight,” he said. Kinney is production manager at Pevnick Desing Inc., and a senior chase guide with Tempest Tours Storm Chasing Expeditions. Given his past driving experiences, we should expect to see him at driver education and autocross events. He reports he’s running on Michelin Pilot Sport Cup+ tires and he’s installed Pagid racing brakes. He’s ready. The Milwaukee Region welcomes all of these members. What’s your story? We will publish the story of you and your Porsche in this column – whether you are a new member or one of several decades. Contact the editor – Beverly.jurkowski@sbcglobal.net. Bev will send you a short questionnaire (four questions) to complete and she will write your story. What’s a young boy to do; Grandpa’s a car guy, Uncle’s a car guy, Dad’s a car guy. I guess it just flows from one to the other and my turn was next. Growing up in the days before cars had computers it seemed like everyone worked on their own cars, changing oil, tune ups even carb rebuilds (remember carbs?). My Dad was no different. I remember being a small boy helping Dad fix the family cars and motorcycles. When I wasn’t helping I was making race tracks out of Legos and Lincoln logs on the living room floor and driving my whole family crazy with the pretend sounds of revving engines. The seed was planted and growing like a weed. When I was 8 or so sitting with my Hotwheels spread all around the floor and watching TV, I saw a commercial that just captivated me; a Porsche cutting through a curvy mountain road like I never saw before. It was fast and sleek and handled like my Hotwheels did on Circuit De Lego. I turned to my Mom and said that’s what I want when I get big. I never gave that idea up. Some years later after Dad passed away it became my job to maintain the family cars and I did so happily. So much so, I decided that I wanted to be a mechanic when I grew up. I did become an auto tech (not sure about the growing up part though) and that just fueled my love for all things motorized. As the years rolled by, like everyone does, I set some life goals. By 30 I would have a house to call my own, a beautiful (and smart) wife, two good kids, a dog and a Porsche, any Porsche as long as I could cut the curves like that old commercial. Almost 30 and I achieved it all but one, no Porsche. Then fate stepped in. Driving home from work a car caught my eye, sitting alone and looking rather sad and un-loved under a tree in a parking lot. “What was that?” I made a u-turn and went back to see. Sure enough it was a Porsche, a neglected 924 sitting on four flat tires collecting dirt and sap. It was filled with construction debris from a home remodel. I went in to the business that owned the lot and asked about the car. Turns out the owner’s parents owned it but no longer used it so it just sat there un-loved. Within a week that poor car was (and still is) in my garage. It’s not the fastest thing I’d driven but it took the curves like I had seen in the ad. I was not yet 30 and my goals were met. Right away I joined the PCA and started to meet all the wonderful people here and began to get involved in the club but other obligations came up and I dropped out of the club. Once again fate stepped in and I came across a 968 -- faster and even better handling. The 968 now sits next to my 924 (um, grandfather and grandchild - that sounds familiar). Urged by my neighbor who himself now owed a Porsche, I rejoined the club and rediscovered all the fun of not just the cars but all the people here. I joined the board of directors and help when I can in events to give something back to the club. My wife Kim also helps with the social activities. That’s my story in brief but it is far from over. I hope to buy a few more Porsches and plan to enjoy the club for years to come and I would encourage everyone to attend many if not all of the events offered. Even if one doesn’t seem like your kind of thing, try it, you might be surprised at what you discover. Members, the classifieds are free. Use them to advertise your Porsche and related stuff. June 23 driving tour -- Check out some photos here. Several members helped clean up Porsche Park at Road America so it looks terrific for the season ahead. Story here. July 1 Cars & Coffee - Check out the photos here. Porsche reports 911 sales up 43% in May in U.S.
Atlanta – June 1, 2012 – Porsche Cars North America, Inc. (PCNA), importer and distributor of Porsche sports cars, Cayenne SUVs and the Panamera four-door sports sedan line-up in the United States, today announced May 2012 sales of 2,852 vehicles. This compares to 2,817 vehicles last May, for an increase of one percent. For the year, Porsche has sold 13,448 cars in the U.S., which is a three percent increase over last year’s sales of 12,996. With 878 sales of the new 911, the recently launched iconic sports car showed a 43 percent increase over May 2011. Porsche’s Approved Certified Pre-Owned vehicle sales set a record for the month of May 2012, with 871 vehicles sold compared to 750 last year – a 16 percent increase. Year-to-date, Porsche’s CPO sales are up 12 percent (4,025 vs. 3,597). 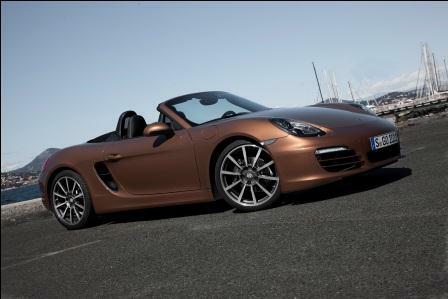 Have you heard about the new Boxster? Here's the official press release and details from Porsche. International Autos also held a debut event on June 28 in Milwaukee. It was a searingly hot day for the gleaming black on brown car to make its debut. This did not stop a number of members from stopping by The Horny Goat Hideaway on S. First Street in Milwaukee to view the shiny new offering by Porsche. Caught in the car is George Kowalski, Region president. Other members in attendance were Bob Shellman, who confessed to immediate infatuation; DJ and Jim Swant, Larry and Lise Miley, and Paul Stewart. 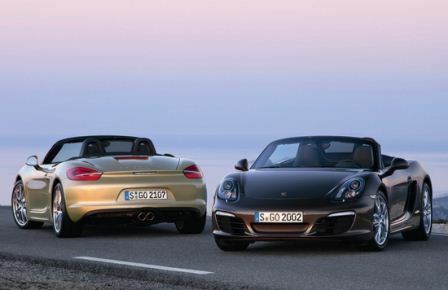 Motor Trend recently tested the new 911 Carrera S Cabriolet against the BMW 650i Convertible and the SL550...can you guess who came out on top? Maybe this quote will help... "The Porsche speaks to my inner child, the one who dreamed of owning sports cars, not cruisers, and it's got just enough practicality and civility baked in to justify it to myself over the other two." Thanks to Mike Wiviott for forwarding this link to Car & Driver's online site. Watch some legendary RUF-built Porsches on the track at Nurburgring. Masterful driving. Unbelieavable handling. Check out this video found by Donna Daufenbach. An interesting view of the rebuild of an engine. Not a Porsche, but still interesting to see the steps involved.